"It was the dawn of the Third Age of Mankind, ten years after the Earth-Minbari War. The Babylon Project was a dream given form. Its goal - to prevent another war by creating a place where humans and aliens could work out their differences peacefully. It is a port of call, a home away from home for diplomats, hustlers, entrepreneurs and wanderers. Humans and aliens wrapped in two million, five hundred thousand tons of spinning metal, all alone in the night. It can be a dangerous place but it is our last, best hope for peace. This is the story of the last of the Babylon stations. The year is 2258. The name of the place is Babylon 5. Featuring the space station that changed the destiny of an entire galaxy, this all new roleplaying game allows players to take the role of characters on board the Babylon 5 station and travel to the many stars and planets seen in the award-winning television series. From lowly lurkers and smugglers through to brave Earthforce Officers and members of the Minbari warrior caste, a whole galaxy awaits to be explored! Characters on Babylon 5: A complete guide on creating characters for use in the game, from disgruntled dock workers and small-time smugglers, to the brave Earthforce personnel who have sworn to place themselves in harm's way and defend their world from any threat. Skills and Feats: A complete breakdown of all the skills and feats featured in the Babylon 5 roleplaying game, allowing characters to specialise in different areas of expertise. 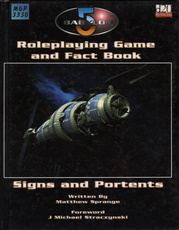 Combat: Full rules for engaging in combat are contained within, allowing a character to face an enemy with his fists, a PPG, or even a Starfury space superiority fighter. Equipment and Vehicles: Covering everything from simple ground cars to the immense star freighters that ply the stars and Minbari war cruisers, players are introduced to all the vehicles present within the galaxy. Telepaths: Humans who manifest telepathic abilities are rare and ruthlessly hunted down by the agents of Psi Corps, while telepaths from alien races have access to incredible mind-bending powers. All Alone in the Night: A detailed look at the station, studying its history, design, locations and personnel. And the Sky Full of Stars: A tour of the galaxy, highlighting the major locations featured in the television series in addition to the Babylon 5 space station. 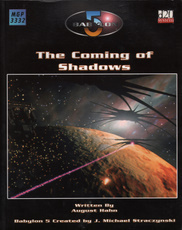 Signs and Portents: The entire first series of Babylon 5 is detailed within this rulebook with a timeline of events, as well as covering all major characters and conflicts that took place in 2258." Spanning the entire Earth year 2258, The Fiery Trial is an entire story arc ready to be dropped into your Babylon 5 roleplaying game campaign. 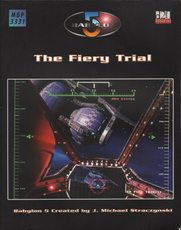 Far more than a single scenario or even campaign, The Fiery Trial is a brand new concept among roleplaying games, building upon the format presented in the Babylon 5 roleplaying game to present an entire story arc for players that can be combined with others of the Games Master's own creation to create a truly unique gaming experience. 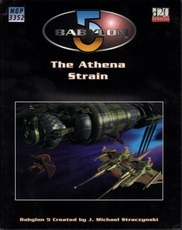 A complete Story Arc for the Babylon 5 Roleplaying Game"
"Featuring the space station that changed the destiny of an entire galaxy, this all new roleplaying game allows players to take the role of characters on board the Babylon 5 station and travel to the many stars and planets seen in the award-winning television series. From lowly lurkers and smugglers through to brave Earthforce Officers and members of the Minbari warrior caste, a whole galaxy awaits to be explored! Personalities: A complete guide on creating characters for use in the game, from disgruntled dock workers and small-time smugglers, to the brave Earthforce personnel who have sworn to place themselves in harm's way and defend their world from any threat. The Galaxy of 2259: The entire second season of Babylon 5 is detailed within this supplement with a timeline of events, as well as covering all major characters and conflicts that took place in 2259. Rules Additions: Full rules for engaging in combat are contained within, allowing a character to face an enemy with his fists, a PPG, or even a Starfury space superiority fighter. Equipment and Vehicles: Covering everything from simple ground cars to the immense star freighters that ply the stars and Minbari war cruisers, players are introduced to all the vehicles present within the galaxy." "The Earth Alliance is one of the youngest spaeefaring nations in the known Galaxy, yet they are also one of the largest and most influential. A hundred years ago, Humanity was on the verge of destroying itself in a global civil war when first contact was made with intelligent alien life. Since then, Man has spread throughout local space to occupy more than a dozen additional systems, fought and won two major wars and several smaller ones, and established diplomatic connections with virtually every race within a hundred light-years. This book will detail the Earth Alliance in its entirety. 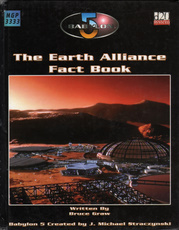 From the homcworld of Earth to the colonies of Mars, Proxima, Orion, and more, every part of the Alliance can be found in these pages. Vehicles, weapons, equipment, characters, and more are examined in complete detail. The roleplaying possibilities are endless! 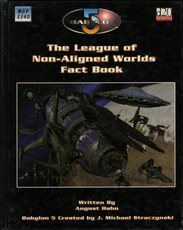 History of the Earth Alliance: Detailing the growth of the Earth Alliance and the events leading up to both the Dilgar war and the Earth-Minbari War. Telepaths: An in depth study of psi corps and human telepaths, including new prestige classes such as the secretive Black Ops Specialist and much-feared Bloodhound. Life in the Earth Alliance: Looking at the colonies that make up the earth alliance, including options to customise Earth Alliance characters based on their origins. Earth Alliance Spacecraft: Earth Alliance civilian and military spacecraft, including information on their development and future. Earth Alliance Ground Forces: GROPOS may not be as glamorous as the fleet, but they still get plenty of toys. Nationality Feats: Background specific options to further customise your Earth Alliance characters." "Of all the races in the universe of Babylon 5, none save perhaps the Vorlons are more enigmatic and mysterious than the Minbari. Possessing a culture steeped in tradition and dogma, the Minbari closely resemble humans but are very evidently not human. They are stronger, faster, and possess acute senses that humanity can only begin to understand. They are deeply spiritual but feel no need to share or even explain their beliefs to others. They gave great respect for their elders and accept the rule of a single council even on worlds far from their own territory. Their ways are unfathomable, even to some of their own kind, yet none dare question their motives. At least, none dare question them openly. 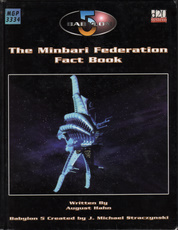 This book will detail the Minbari Federation in its entirety. From the homeworld of Minbar to its colonoics, culture, religious practices and military every part of the Federation can be found in these pages. Vehicles, weapons, equipment, characters and more are examined in complete detail. The roleplaying possibilities are endless! Characters - Expanded rules, prestige classes and feats for Minbari characters"
Personalities: Updates to all of the main characters of the series, as well as statistics for the newly arrived. The Galaxy of 2260: The entire third, explosive season of Babylon 5 is detailed within this supplement with a timeline of events, as well as detailing all of the major and minor events of the year, new characters to the series and rules and advice on how to integrate every episode into your own campaign. Rules Additions: Babylon 4, Shadow technology, the death of personality and the Anla'shok Ranger prestige class - just some of the new rules introduced in The Point of No Return. Equipment and Vehicles: From Screamers to syntheplast, the technology and new items of the series are given life and statistics here, culminating in an expansion of the ships detailed for the game including the long-awaited statistics for the dread Shadow Ships." "The Centauri are a people born of kings and the inheritors of dreams. Such a people are motivated by many things. Some want to keep their wealth and power. Others want such things for themselves. Some want to stand proudly amid the stars and shout their names for all to hear. Others just want to feel pride one more time before they die. The Centauri will rise, once more, to the heavens, no matter the cost. This book will detail the Centauri Republic in its entirety. 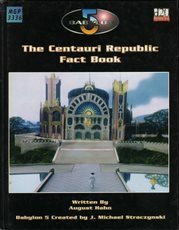 From the homeworld of Centauri Prime to its colonies, culture, religious practices and military, every part of the Republic can be found in these pages. Vehicles, weapons, equipment, characters and more are examined in exacting detail. The roleplaying possibilities are endless! Campaigns - Advice and information for incorporating Centauri into ongoing adventures"
"It has been said that to defeat the monster, one must become it. There can be no greater example of this than the metamorphosis of the Narn into what they have become. There is, however, an inner peace left within them that not even a hundred years of slavery and warfare can extinguish or destroy. The Narn are a slucly in contrasts. They are a brutal, savage race capable of much bloodshed and violence, but they are also inherently spiritual and given to lengthy philosophical debates and contemplative reflection. When the final day of the Narn dawns, their destiny will be only what they make it. No one else will ever shape the future of the Narn again. Whether they fall into darkness, consumed by their own hatred, or rise above their own past to find a new fate among the stars, they will do so through the strength or weakness of their own character. Campaigns - Advice and information for incorporating the Narn into ongoing adventures"
"We are dreamers, shapers, singers and makers. We study the mysteries of laser and circuit, crystal and scanner, holographic demons and invocations of equations. These are the tools we employ and we know any things. Mysteries wrapped in enigmas, the Techno-Mages are a poorly understood force within the galaxy. Operating to their own agendas, with a rich and unique history. 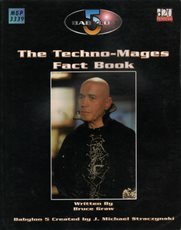 The Techno-Mages fact book allows players and Games Masters alike to bring these powerful and ancient scholars into their games. History: A complete history into the origins and development of the order of Techno-Mages, including their associations with the First Ones and the younger races. Techno-Mage Feats and Prestige Classes: Techno-Mages use powers unknown to the younger races in the galaxy, they have their own rituals, specialisations and options for empowerment. Spells: The science of the Techno-Mages is so advanced as to appear magical to those of inferior technology. Items: An array of Techno-Magical items, including the mysterious Pinnace. "In the world of Babylon 5, perhaps no single example of the fractious yet enduring concept of unity can be found than the League of Non-Aligned Worlds - several very different, very alien groups brought together by the universal languages of need and fear. United in their desire to have more power than they could individually wield, the League of Non-Aligned Worlds collectively represent more ships, more guns and more temporal power than any of the 'major' governments of the galaxy can claim. Even the Minbari Federation would be hard-pressed to deal with the enmity of the entire League. Characters - New feats and prestige classes"
Rules Additions: Vorlon and Shadow Servants, hitchhiking across the galaxy, interrogation techniques, news broadcasting and organic technology - just some of the new rules introduced in No Surrender, No Retreat. Equipment and Vehicles: From Centauri assassination wands to purgative drugs, the technology and new items of the series are given life and statistics here, culminating in an expansion of the ships detailed for the game, including rules for the Shadow-enhanced Warlock class destroyer." 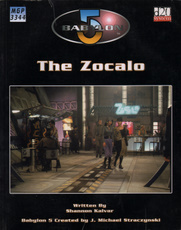 "The Zocalo is a teeming marketplace set at the heart of Babylon 5. Stall holders and shopkeepers ply their trade to thousands of workers and tourists as they pass through the centre of the huge spacestation. And all manner of goods, both mundane and fantastical, can be had. It is a cosmopolitan mix of races and cultures, built out of the need for progress and understanding, but beneath this fagade of co-operation beats a black heart. A seedy black market of illicit goods and services can be had for those who know where to look. Equipment & Weapons - A plethora of gadgets and gizmos, ranging from the ridiculous to the sublime. Most items debut here, although a careful viewer will recognise them, or at least their implied presence, from the show. renting a starcruiser or putting on a fireworks display. Creating Items - A complete system is presented for creating unusual and unique artefacts, some of organic technology, others simply built using theories of technology radically different from anything currently in operation. exploration in the Zocalo itself. Black Markets - The Zocalo also explores the black markets on Babylon 5. A knowledgeable shopper can find anything from fake identification cards to enough guns to supply an army." 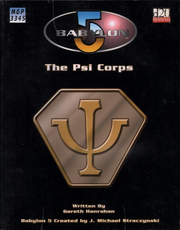 The text has scattered notes by Byron, to tell the truth in the face of Psi Corps propaganda. A fun read. "Telepathy is fundamentally communication - a bridging of thoughts, a direct link between minds. Civilisation is built on communication; telepathy is the most recent link in a chain that began with cave paintings, primitive grunts and gestures. Each new medium of communication brings upheaval in society. The printing press, the telephone, tachyon transmission and the rest all wrought change, engendered fear and confusion before they were understood and seen by society as necessary steps in evolution. The Psi Corps is a bridge to the future. As the past century has shown, the changes needed to assimilate telepathy into human society are difficult and painful. The Psi Corps holds telepathy in trust, protecting it from abuse and finding the best possible path for it. It is a necessary step as we take our place in the galaxy." "Of all the groups, secret societies and allegiances created in the Babylon 5 setting, the most memorable and influential is arguably the Anla'shok. The Rangers are an intriguing organisation best defined not as what they are but as what they are not. The Rangers are the guardians at the gate, the shadows against the shadows. They are not warriors on any battlefield but the hidden ones of back alleys on distant worlds and the corrupt corridors of traitorous powers. This sourcebook both removes some of the mystery from the Anla'shok and adds several new layers of 'grey area' for Games Masters to use in their campaigns. It greatly expands the character options for Rangers, both in the hands of Players and as characters they encounter during the course of a campaign. 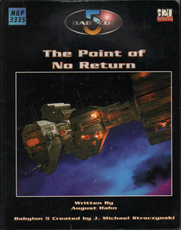 The full history of the Anla'shok, from their founding a millenium ago to the changes brought about by the formation of the Interstellar Alliance, along with guidelines for professional behaviour, how to proceed during missions and what procedures a well-trained Ranger should take when dealing with unknown lifeforms, interfering government officials and even the most dangerous of combat situations. The various tools and weapons available to the Rangers for use in the field, from the ubiquitous denn'bok to the multiple forms of the White Star combat vessel at their command, including a walkthrough of a standard White Star cruiser from aft docking bay to its front weapons array. that Rangers find in the most unlikely of places. 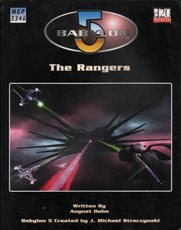 This book is also filled with information about how to play Rangers as characters, including new prestige classes, the Ranger as a full character class and new feats and options for members of the Anla'shok to take during play. Gamemastering tips are given on how to incorporate the Anla'shok into existing games or create a new campaign centred on an Anla'shok group." The Galaxy of 2262: The galaxy of 2262 is undergoing drastic change. 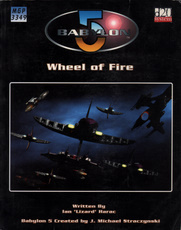 The entire fifth season of Babylon 5 is detailed within this supplement with a timeline of events, as well as sections detailing all of the major and minor events of the year, new characters to the series and rules and advice on how to integrate every episode into your own campaign. Rules Additions: Bodyguards, Media Stars, psionics, artificial organs, crime scene investigation - just some of the new rules introduced in Wheel of Fire. Equipment and Vehicles: The deadly Redhelm Fighter, the holy Book of G'Kar and the invaluable survival bubble -just some of the new equipment and vehicles available in this book." "Mars, hanging blood red in the sky, has long been associated with war. darkness and death. It has been the imagined source of both alien invaders and ancient wisdom for centuries. Finally, in the 23rd century, there is life on Mars - human life, for the most part. Mars is the most populous planet in the Solar System apart from Earth and the most capable of sustaining itself without outside support. It is also a world that lives up to its name, for it is enmeshed in war. From the slaughter of John Carter, to the Food Riots, the brutal crackdowns of the Clark Administration and the final liberation from Earth rule, Mars has always been the site of constant struggle. Martian History & Culture: Mars is described in all its glory and muddied history, from the lowliest homesteader dome to the grandiloquence of New Vegas. 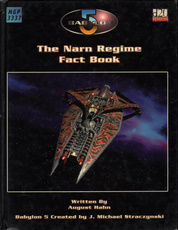 Every timeline is described, from the cold war periods of unrest, to the 'freedom fighter' times of the late 2250s/early 2260s and finally the post-liberation era of a finally Free Mars Terrorists, corporate interests, Earth enforcers, renegade blips, Psi Corps researchers, activists and even the new Rat King prestige class - no matter your cause, you can find a place on Mars. 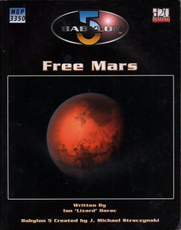 Rules Additions: Free Mars includes detailed rules on forming and running your own Resistance cell, be it an ultra-violent militant branch or a peaceful protestation collective. A simple yet ingenious system allows Player Characters to mould and nurture their organisation, while the Games Master arranges the reactions of the Martian world to the Players' group and its actions, whatever they may be. New Buildings, Vehicles and Equipment: All the necessary descriptions and statistics are given for living and adventuring on Mars: Dustbuggies, mobile homesteads, abandoned domes, mapping aids, Mole vehicles and more are all contained within." Personalities: Full statistics for all the main characters in the series, as well as updated statistics for Babylon 5 characters. 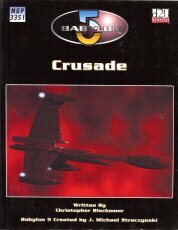 The Galaxy of 2267: The entire broadcast season of Crusade is detailed within these pages, as well as the preceding movie A Call to Arms and descriptions of the three 'lost tales' never filmed. Each episode contains rules for new events and advice on how to integrate fresh themes into your own campaign. Rules Additions: Crusade fully details the Thieves' Guild, doomsday cults, the Bureau of Telepathic Integration (including the dreaded Mr Jones), Zanderians, a selection of new feats and a new skill, Gamble. There is also a chapter detailing the strange and dangerous artefacts of 2267, from the immense Shadow Death Cloud to the enigmatic yet equally dangerous Apocalypse Box. Last, but by no means least, comes the statistics for Excalibur itself, describing all its important personnel and capabilities." Rather than a linear progression of scenarios, this book presents a toolkit to run the events of the Athena Strain and covers how events may diverge from the 'scripted' timeline. This book begins with a number of timeline-derived scenes, followed by events that may occur through the actions of the players and how these might affect how the disaster unfolds. Finally, details on the space liner Athena, its crew and passengers and some of the other factions involved in the scenario are presented, explaining the forces at work and how they influence the forthcoming events." "The Earth Alliance has risen from an obscure minor race to one of the powers of known space, the equals of the old Lion of the Galaxy or the Narn Regime. Even the mighty Minbari failed to defeat the Alliance. The Alliance's strength is founded on EarthForce. The fleet's Hyperions and Omegas patrol the human colonies, while Explorers push out towards the Rim. GROPOS troopers have fought on a hundred alien battlefields to keep humanity safe. Starfuries patrol the space above every world from Ceti Gamma to Sinzar. As the Alliance grows and the alien races grow more jealous of humanity, the need for military strength grows ever greater. 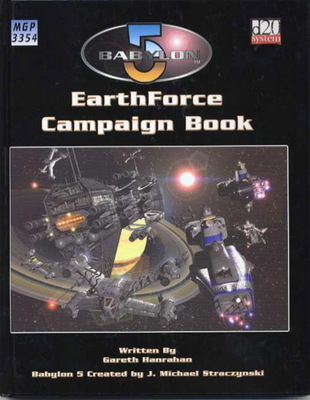 The EarthForce Campaign Sourcebook describes the history, deployment and organisation of EarthForce, complete with ranks, regulations, equipment and missions for everyone from the lowliest groundpounder to the Joint Chiefs. It also includes a full campaign structure that can be used as a once-off adventure or a fully-fledged epic campaign centred on EarthForce. The Eurystheus Campaign: An immense and exciting EarthForce campaign that immerses the Player Characters and their ship, the EAS Eurytheus, in the Earth-Minbari War, the rise of Clarke and even the deadly Shadow War. EarthForce Life: Every aspect of military life is covered, from typical daily routines and drills to emergency procedures and ship or unit hierarchies. Tours of Duty are detailed from 2240 to 2262, allowing characters to plot their path through the ranks of EarthForce during the most tumultuous era of human history. EarthForce History & Organisation: A complete guide to the overarching structure of EarthForce as a whole, down to the individual squads and ranks that make up the Army, Navy, Intelligence, Reserve, Command & Civil arms of Earth's standing military forces." Intelligent life is ancient in this universe. Before the Earth and the Sun congealed out of space dust, there were races travelling between the stars in shining ships. Living beings heard the echoes of the Big Bang reverberate off the cosmic spheres. Alien voices sang as the stars of this galaxy were born. These beings eventually found life developing on a hundred worlds. Not wanting to be alone, they nurtured this burgeoning life. Slowly, over millennia, more sentient beings evolved and took their first steps towards the stars. These races would become the Vorlons and the Shadows. Unfathomable years later, they would be as gods to the Younger Races. One embodies the principle of chaos. The other purports the rule of order. Darkness and Light, each as terrible and powerful as the other, locked in an aeon-old struggle for dominance of the galaxy. History & Technology: Full histories of both races, told from both sides of the moral divide, and the fantastic details of their technological advances - and how they work. First One Servants: All the many types of Vorlon and Shadow Agent are detailed within, along with their major client races, such as the Drakh, the Ru'Harus, the Ascori and the Zener. 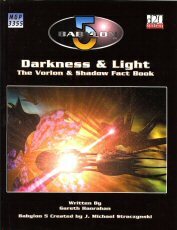 Characters: Full rules on playing a Vorlon or Shadow character! Realms: From the Vorlon Empire to the Shadow Dominion, all the major client worlds of both races are reviewed. A wise person once said, 'Money is the root of all evil'. There is very little that has not or will not be done for money. Be it dollars, credits, ducats, toka or ook'ar'a... greed sees no difference. The lifeblood of trade lies in the worth of currency and few would argue against its greatness. While some understand just how powerful the application of funds can be, traders feel its weight like no other. 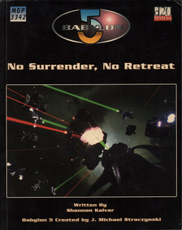 The Babylon 5 universe is filled with starship battles and riots that permeate the galaxy. Yet not all plots and schemes are enforced from behind a firing console or powered-up PPG. Most are fought with credits and politics, boycotts and embargoes. Wars of this kind can be fought without a single shot being fired but still crush entire populations in their wake. A merciless master of trading warfare controls thousands, making pawns of all others. 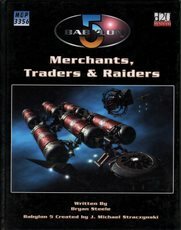 Life on the Trade Routes: Babylon 5: Merchants, Traders & Raiders contains all the essential information a player or Games Master needs to run companies that span the jumproutes or intrepid independent trading ships. Raiding the Space Lanes: From details of famous Raider cells to advice on starting your own predatory group, this book has all the technical information you will need to conduct interstellar piracy. New Spacecraft & Equipment: From the humble xenotranslator to the newest design of Delta-V Advanced Fighter, this book has new tools and vessels for all kinds of spacefarer."